Although not suitable for most people but came across this buy one get one free for entry to SeaWorld and/or Aquatica Orlando. The offer expires Monday 27th November. Also buy one get one free offers on the optional upgrades. Must visit to redeem by 15/03/2018. Online only. 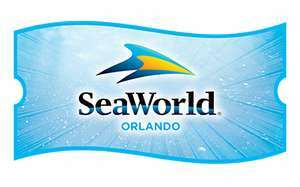 For SeaWorld will be $99.99 saving for two adults. For SeaWorld and Aquatica will be $149.99 saving for two adults. Makes me sad seeing the orcas at these SeaWorld places. Agreed, the documentary ‘blackfish’ was truly eye opening. I’m off to California next year with the family. We’re going to do the whale sight seeing trip from Monterey Bay. Hopefully we should see some of these awesome creatures in their natural habitat along with other whales and sea life. Shame it's only until 15th March. Would have loved these for my trip in April. Shame it's only until 15th March. Would have loved these for my trip in …Shame it's only until 15th March. Would have loved these for my trip in April. Before you go on your trip please take a few hours to watch The Cove and Blackfish. Abusement parks are not fun for the animals. Don't fund SeaWorlds cruelty. Cold. To be fair to seaworld they have listened, no more whales born in captivity so they are in the process of change. They are a business and deserve a chance to put it right. To be fair to seaworld they have listened, no more whales born in …To be fair to seaworld they have listened, no more whales born in captivity so they are in the process of change. They are a business and deserve a chance to put it right. That's kind of besides the point. Making money from slavery is not cool, which is essentially what they are doing, taking these animals out of the wild, or breeding them and putting them in tiny goldfish bowls when their natural range is hundreds or sometimes thousands of miles. Making them perform circus tricks so as not to go hungry amongst other inhumane and cruel practices. That's kind of besides the point. Making money from slavery is not cool, …That's kind of besides the point. Making money from slavery is not cool, which is essentially what they are doing, taking these animals out of the wild, or breeding them and putting them in tiny goldfish bowls when their natural range is hundreds or sometimes thousands of miles. Making them perform circus tricks so as not to go hungry amongst other inhumane and cruel practices. To be fair they are not doing that anymore are they? So give them some credit. To be fair they are not doing that anymore are they? So give them some …To be fair they are not doing that anymore are they? So give them some credit. Credit for what? They still hold whales captive and make them perform tricks for food. They only change their practices when public pressure gets to much and their stock price drops. Credit for not capturing animals anymore and no longer breeding them in captivity. Should they just close down before your happy? Are they not listening? Give them chance to change their business model.